Many people don’t know that oxygen can be a form of therapy. But we all know that we need oxygen to live. In the air we breathe every day there is about 21 percent oxygen and 79 percent nitrogen. Interestingly, our bodies only take in about 5 percent of O2 from that total in each inhalation. When a higher amount of oxygen is required by an individual, oxygen therapy is used. How our bodies process oxygen? After inhalation, the oxygen we take in travels to our alveoli. This is the place where primary gas exchange occurs. With the help of the pulmonary capillaries, oxygen in diffused into our blood stream. From there it bonds to the haemoglobin in our blood and is carted to all parts of our bodies. Meanwhile, the alveoli separate the CO2 and nitrogen your body doesn’t need from your blood stream and adds it to the air you exhale, which is enriched with these gasses. Why oxygen therapy is used? With such a complex and efficient system of gas exchange running naturally in our bodies, you might wonder why oxygen therapy is needed. Here at Haym Salomon, we provide supplementary O2 to people whose gas exchange system is compromised in some way. This can be the result of a lung issue which means the alveoli aren’t working normally. This is not the only application though. Oxygen therapy is used to treat any number of conditions, both acute and chronic. Oxygen therapy may also be used to aid a patient’s recovery after an accident or injury in which damage has been caused to the body’s tissues. Oxygen expediates the healing process in our tissues. How we use oxygen therapy? 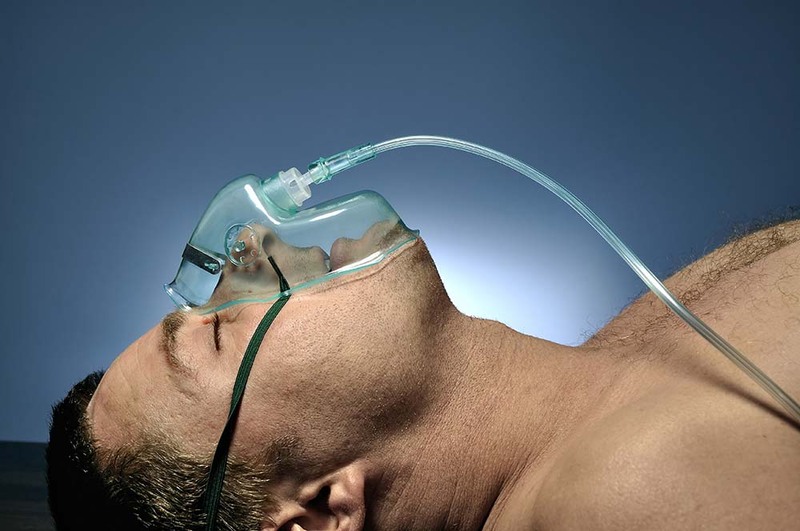 Oxygen is generally given to those who need it through a ventilator or Venturi mask. Some people may be given a portable tank containing enriched air which they can move around with them. When we say enriched air, we mean air that has a higher concentration of oxygen than normal. Instead of the standard 21 percent, people on oxygen therapy will be given air that contains 30, 35, or 50 percent oxygen. The amount depends on their needs. While our residents are undergoing O2 therapy, our skilled nursing staff keep an eye on each resident’s saturation levels. The level needs to be maintained at a 90 to 92-percent level depending on the individual. If these levels drop significantly, it could trigger respiratory distress—that’s difficulty breathing. Although O2 therapy is generally not considered a difficult thing for patients to go through, our nursing staff and resident specialists need to keep a close eye on patients. Our experienced and dedicated team monitor patients’ oxygen saturation levels very carefully at all stages of treatment. Not only so that saturation levels drop too low, but also to make sure that too much oxygen hasn’t been delivered. Although our bodies need oxygen, we can get too much of a good thing and oxygen toxicity can occur. This is, however, rare in a clinical setting that is not hyperbaric in nature. Oxygen therapy is key for many of our patients and they know that at Haym Salomon Home for Rehabilitation & Nursing in Brooklyn they are in good hands.